The 2019 Vespa Elettrica attracted a huge crowd at the Piaggio stand at EICMA this year. It is hardly the only electric scooter today, as the fair was filled with them, especially from China. 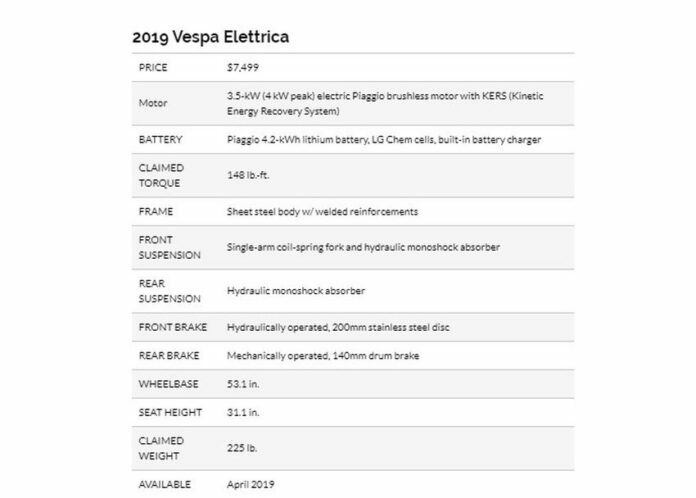 This is a Vespa however, and it shares some of the features of its other models. For example, the body is similar to that of the Vespa Primavera. 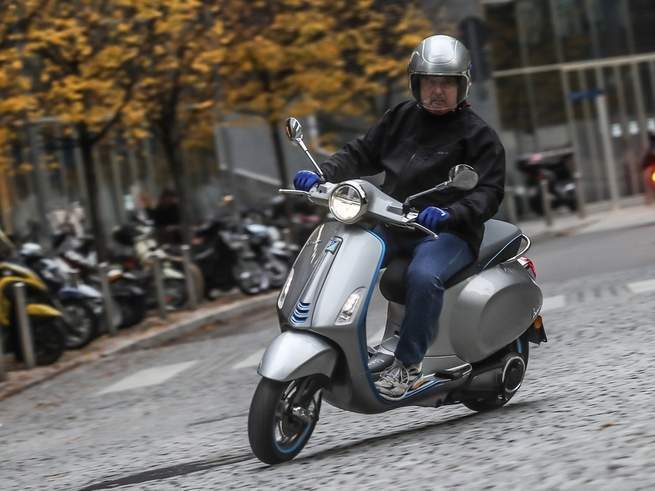 The design is neat and clean, as it lacks the exhaust because of the electric motor.The Piaggio Styling Department picked a nice silver gray shade, with contrasting color striping at the edge of the front shield, as well as around the wheels. The Elettrica is runs on a 4-kilowatt motor, which is the maximum power a moped can have. 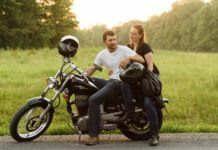 This results in ultra-low insurance rates and the lack of yearly road taxes. Piaggio developed both the engine and the air-cooled 4.2-kWh lithium-ion battery. Their Electric Vehicle Department worked with LG Chem to produce to a solid and reliable 48 V battery. This deserves praise because lithium-ion batteries are the most capable, but also the most critical when poorly thermally stabilized or physically abused. Since 1946, Vespa has been about reliability. 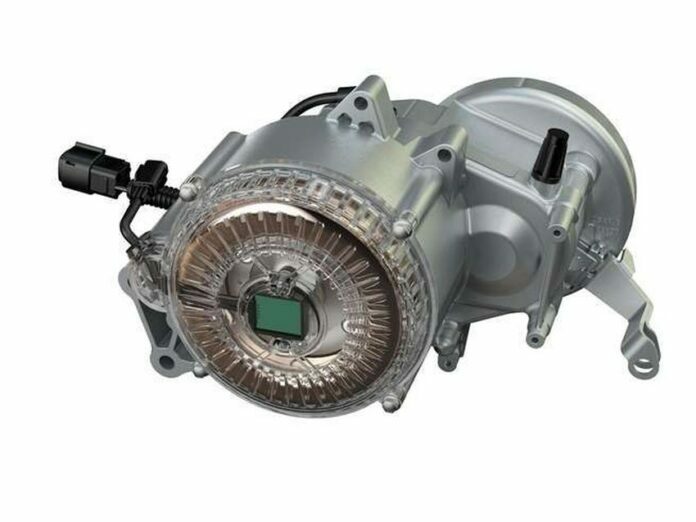 Like the other electric motors, it delivers a higher peak torque. Here, the 3.5-kilowatt (4 kilowatts peak) motor delivers 148 pound-feet at 0 rpm, resulting in brisk acceleration properties without a gearbox, with a 15:1 primary transmission. 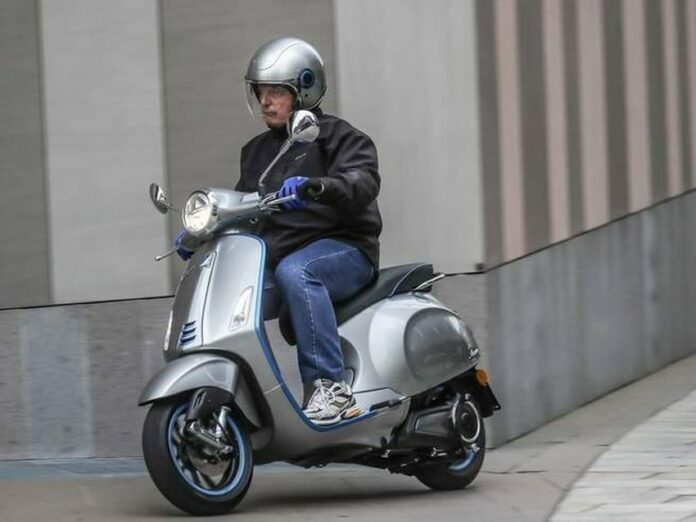 Riding the Elettrica is easier than riding any other Vespa model. 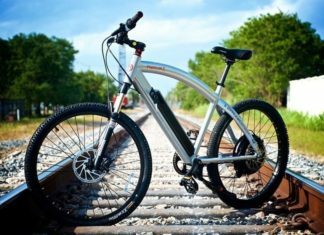 The rider only needs to select the power mode, full or eco, the intensity of the energy recovery, and the braking effect when decelerating. One touch of the power mode gives you reverse for easier parking. 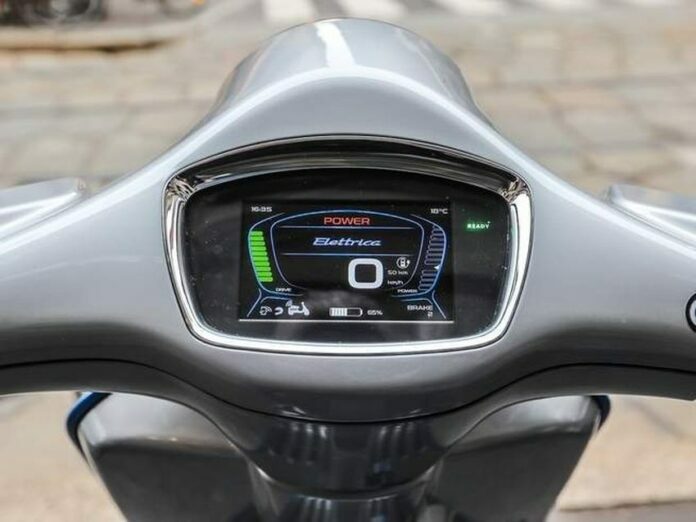 The Elettrica talks to the rider through a TFT display at the center of the handlebar, offering Bluetooth connectivity to a smartphone. It is light and easy to control. It reaches 32 mph (50 km/h) quickly and remains stable. This is the maximum speed allowed for the mopeds. Overall, the new Vespa model is very functional, practical, safe, fun and easy to ride. One drawback is the battery pack recharge. 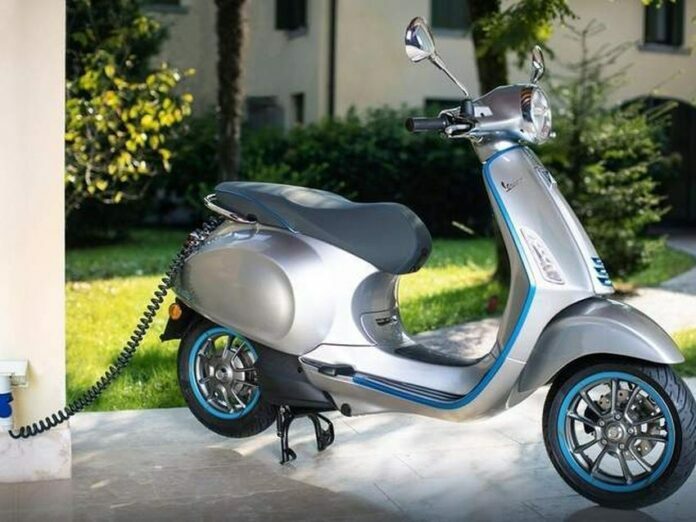 The moped comes with a recharging system, and it takes around four hours to fully recharge from a European household 220 V socket, and slower times from an American 110 V plug. A full battery charge will give you more than 60 miles in eco mode, meaning a 20-mph top speed at half the power and same peak torque and acceleration. In real life, by using eco, the average daily town riding is limited to 6 miles in Europe, and the limit is similar with the populated US cities. Basically, all it takes is one recharging session per week. 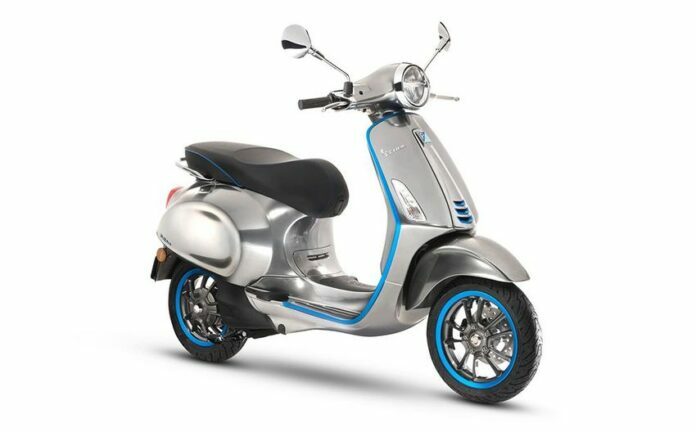 As we mentioned earlier, the Vespa Elettrica is very easy, safe, and comfortable. This is more than enough to attract the attention and stir the hearts of the feminine public like no Vespa before. 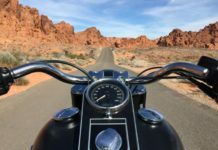 Always the plus with electric mopeds is the fact that the rider does not need to suffer fumes and the smell of gasoline during and after their ride. In Italy, this moped is not at all cheap, and will set you back $7,499. However, the value is there, as both the quality and the execution are of the highest standard.